* History: The Buttahatchee River is a tributary of the Tombigbee River, about 125 miles long, in northwestern Alabama and northeastern Mississippi in the United States. 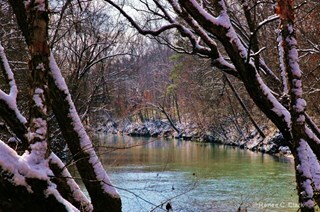 Via the Tombigbee River, it is part of the watershed of the Mobile River, which flows to the Gulf of Mexico. 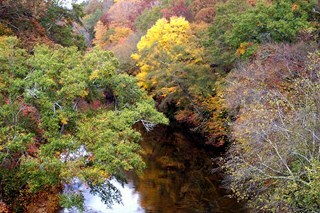 The name "Buttahatchee" is Choctaw for "sumac river", from bati, "sumac", and hahcha, "river." ** Recreation: Buttahatchee is a very nice Class I river, a great Class I and II float for rec boats and canoes. There are some good rapids, good fishing and beautiful cliffs. East of Hamilton on 278 there are two bridges that cross the Buttahatchee. The best section (with most rapids) is between these bridges. Its best level is from 500 to about 1500 cfs. A couple of rapids might be pushing Class 2 at high water. 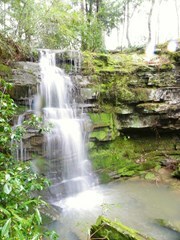 It has cliffs and a landscape very similar to Bear Creek (west). There are many houses visible from the river. The water quality is better than average here, and the fishing is great. Like most places around here, it’s better in the winter, and tough to catch at the right level in the summer. It is very rocky and you'll scrape all the way down at low water. The first bridge outside Hamilton on 278 is the take out (with posted signs). The next bridge upstream on 278 is a newly built concrete bridge commonly known in the area as “burnout bridge" or the "new" bridge because a jet fuel tanker truck crashed on the bridge and burnt it up about 15 years ago. Between these two bridges are the best rapids. There are approximately four or five Class I rapids and many good shoals.